Wes Gietz will tell you he grew up on a lake, spending hundreds of hours of solitude in the Ontario bush. His family spent two months of every summer holiday on that lake in a cabin his father built. But like many people, education, career and the modern adult life took him far away from the outdoors once he was grown. Then, 24 years ago, his brother convinced him to go on a winter camping trip, at the end of which he gave Gietz a copy of the book The Tracker by American naturalist and survivalist Tom Brown Jr.
“That book ruined my career,” says Gietz with a laugh. Brown’s writing tapped into Gietz’s personal interest in primitive skills and the spiritual qualities of the outdoors. Over the next 12 years, Gietz would attend Tom Brown’s Tracking, Nature and Wilderness Survival School in New Jersey 10 times. The experience set him on a path that has grown into a deep interest in self-regenerating communities and cultural repair. The path from there to here started with a simple realization. “If I wasn’t going to lose these primitive skills—because there was nobody in this part of the world who knew anything about these skills as far as I could find—I had to start teaching,” says Gietz. So Gietz started offering half-day workshops in things like bow drill making, (an ancient form of drilling tool commonly used for fire making), wild edible and medicinal plants and shelter making. Participants were primarily single men and women in their 20s and 30s who found his classes through word-of-mouth. And they all shared one thing in common—they wanted to reconnect with nature in some fairly basic fashion. Gietz started offering the workshops more and more, taking advantage of the work flexibility provided by his then-career in management consulting. By 1999, he realized there was a big enough group of primitive skills experts in the area to form the Firemaker Primitive Skills Society. The society’s mandate is to create community-based opportunities for learning, practicing and sharing ancient skills and technology. Every summer, Firemaker offers a week-long gathering for anyone interested in nature-based living and primitive skills—this year’s event will be held at Camp Gilwell in Courtenay. As founder, Gietz sat on the Firemaker council for 10 years and is the only person to have attended all 15 Firemaker gatherings. It was 1994, though, that was a watershed moment for Gietz. “A friend of mine, a young woman for whom I have a lot of respect, pointed at me and said, ‘Jon Young is doing this program, the Fine Art of Mentoring, and you need to go,’” says Gietz. “There was no question about it, and I said yes. “I sort of knew what ‘art’ was, I didn’t really know what ‘mentoring’ was, and ‘the art of mentoring’ had no meaning for me at all, so I was completely open and it blew me away,” Gietz adds. What Gietz experienced is something known as coyote mentoring—a style of teaching made popular by Young, Tom Brown Jr.’s first student. It is a style of teaching that uses the natural world to engage people of all ages in the learning process. The method draws on the vast experiences of indigenous cultures from around the world, and is as much about teaching as it is about the ways of life that keep cultures intact and healthy. Young refers to that part of coyote mentoring as the cultural basket, and it is the context in which all mentoring happens. In the basket are models such as the seven attributes of the sacred human being from the Lakota, the natural cycle of learning from the Mohawk, the human journey from the Anishnaabe, and much more. “I wanted to learn that model, because the conclusion I came to was this is a different way of life and it’s cohesive and I want to bring this home,” says Gietz. Gietz attended the Fine Art of Mentoring three times and then started offering programs for children in the Comox Valley based on what he had learned. In one of the early programs, he took a group of students out to a wooded area in Comox. The group spent some time wandering around, exploring the area before Gietz turned to the kids and asked if they would be interested in building a fort. They agreed and started gathering materials to build the fort. In fact, what they were building was a debris hut, a form of emergency shelter. While gathering the materials, the kids found some bugs they’d never seen before. Gietz hadn’t seen the bug either, but informed the kids that he had a field guide in his car that might have the answer. One boy was so fired up about finding out what this bug was that, when the group eventually got back to the car, he reminded Gietz about his promise of the field guide and spent 10 minutes searching the guide for the bug, which he found. In that one day of playing and having fun, those kids learned two important things—how to build an emergency shelter, and what bugs lived in that wooded area of Comox. “It was so much fun, and it felt almost effortless,” says Gietz. These early mentoring programs eventually grew into the Togethering, a five-day program on Vancouver Island for people of all ages who want to experience and learn firsthand about coyote mentoring. Over the five days, participants create a village, live within the cultural basket, and learn about cultural skills such as: How do we pass knowledge on to others in a way that is empowering, effective, and fun? How do we enrich our lives together as well as in solitude? How do we address differing interests and needs in a healthy and respectful way? Gietz points to the skits participants put on at the end of the Togethering to capture the highlights of their five days. “It’s really important to laugh at ourselves, and some of the ways they’ve portrayed me are hilarious.” For example, Gietz used to have a ponytail, and one year a boy tied a bunch of twigs to the back of his head to imitate the hairstyle. Just to make sure no one could be mistaken about who he was poking fun at, the boy had even managed to convince Gietz’s wife Gloria to lend him one of Gietz’s hats. 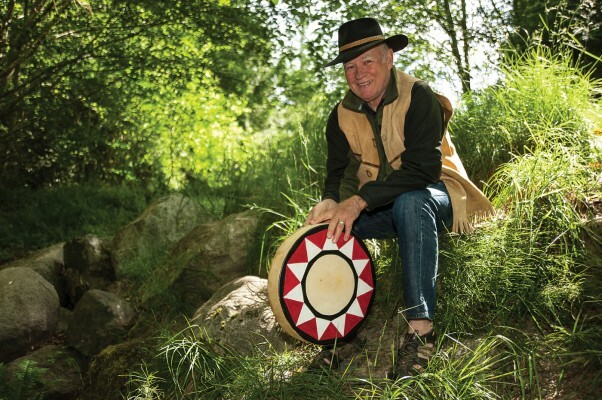 Today, programs like the Togethering, and other nature-based mentoring and rites of passage programs, including a Vision Quest and 24-Hour Solo, make up what Gietz refers to as his vocation. Bilingual in French and English—and learning Spanish as well—Gietz holds Bachelor’s degrees in chemistry and English, and Master’s degrees in biochemistry and public administration. With 15 years of consulting experience in training, strategic planning and human resource management, Gietz has taught at the University of Victoria and North Island College. Gietz notes that modern, western society is one built on separation—we live in separate houses, we are schooled by age groups, and we pursue individual material well being. The result is a society that disempowers everyone. Young people are never given the opportunity to learn who they are or gain a deep connection with their sense of self, and anyone beyond retirement age is left wondering what to do with themselves. In fact, he sees those changes all the time in participants at the Togethering, some of whom experience intense emotions and a deeper spiritual awareness. The Comox Valley is full of foodies. We have farmers, producers, chefs, great local markets and restaurants that feature local produce. We have all your regular farm veggies available as well as specialty meats, seafood, natural soda pop, an organic chocolatier, gourmet yogurt and so much more. There are so many people connected to the food culture within the Comox Valley that an endless interest could be born if one began to explore it. And that is just what Edible Valley has set out to do. Edible Valley began as a dream. When Blayne Prowse awoke one morning he realized that whenever he and his good friend Jonathan Frazier got together, they talked about food. Something was always up and coming in relation to food, so why not create a venue where all the diversity of the food industry in the Comox Valley could be explored and shared within the community? And so the Edible Valley Podcasts began. After a few unsuccessful attempts at recording and the inevitable learning curve of a new venture, the first official podcast was recorded and posted in March of 2012. The first podcast was an overview of what the two friends hoped to accomplish in the show. Frazier, who has been in the industry for more than 20 years, started his career as a dishwasher at the Kingfisher when he was 15 and then completed his interprovincial Red Seal Apprenticeship in cooking in 2000. He then moved to Victoria where he worked in hotels and restaurants, took on some catering, and even worked upon the Maple Leaf as chef while it sailed about for a season. In 2005 he returned to the Comox Valley as Executive Chef at the Atlas Café. “I returned to the Valley because I was kicking around Victoria and I was watching how the Cowichan Valley was being promoted. It made me realize how much more the Comox Valley has to offer,” he says. “I knew the Valley, and I knew the people who were producing the food, and joining up with the Atlas gave me the stepping stone to reconnect and start promoting the Valley,” says Frazier. Through the Atlas, Frazier has been involved in many local promotional activities such as being part of the Chef’s Association, which created a cookbook called Island Inspiration. The cookbook references both local chefs and local food products within the Comox Valley. Atlas Café also won “Yummiest Restaurant” in the 30 day challenge to eat local food, and has been involved in such festivals as Flavor and Dine Around Comox Valley. With his involvement in the local food scene, Frazier was able to connect to many of the “behind the scenes” producers. But the show didn’t stop there. They really wanted to delve into all aspects of food, including growing, selling and preparing it, and reached out to interview anyone related to the industry in the Valley and on the Island. There are now more than 50 episodes posted online with featured stories including Tannadice Farms, Royston Roasting Company, Dr. Don Wilson in regards to the paleo diet, Island Gourmet Trails, Clever Crow Sea Salt, Hollywood Oysters, as well as local fishermen, chefs, business owners and people who compost, to name just a few. Luckily Darren Howlett, who had been one of the first guests on the podcast and had filled in a few times as a substitute co-host, was excited to merge with Edible Valley. He replaced Prowse as co-host in the summer of 2013. When Howlett joined Frazier they put the show on a mini hiatus to re-envision where they were going with it. Howlett started doing a segment loosely called “food facts” in which he researched a certain product or food and discussed that in a separate podcast. Howlett started his first cooking job when he was 14 and has experienced all aspects of the restaurant industry from dishwashing through serving to cooking, managing and even owning both a bar, which he sold, and his current Sushi business called Kama Bento. “I started feeling like I wanted more people involved in the industry,” Howlett says of his foray into teaching people how to cook. “It’s tragic that so many people don’t know the basics… a lot of people who need to learn to cook are not interested in going to a cooking class.” So he began to explore unconventional methods to teach cooking and had just posted a few cooking demos on YouTube when the offer to merge with Edible Valley came. While the podcasts focus on a casual approach they are conscious of the timeframe. The new episodes are shorter than they used to be, and posted within a few days to ensure the content is precise and current. “The podcasts allow for an in depth focus on one item,” says Howlett. “Sometimes we get chatting and we can talk for two hours—we’re causal to a fault!” Editing will trim it down, posting more highlights to the website or creating two episodes if the discussion goes too long. Their most recent show features albacore tuna and took the audience through all the steps of preparing Cajun Crusted and Pan Seared Albacore Tuna with Roasted Red Pepper Aioli, and Kale Caesar Salad with Polenta Croutons using local greens and Clever Crow’s Cajun seasoning. “I like working from scratch,” says Frazier, who completes each step on air including roasting the red pepper, whisking the aioli and Caesar dressing, and walking viewers through how to create a polenta crouton. The Podcasts were originally recorded at Jet FM, and after a brief stint in Frazier’s own basement recording studio, Edible Valley found its current home to record at Studio Live! in Cumberland. Four cameras are operating for this particular video and plates of fresh greens and cooking ingredients are piled high on set. James Mattila, who co-owns the studio, points out the special effects on the camera, the overhead view catching all the steps we can’t see standing in front, and the “knife mike,” which is used to capture all the sounds of cooking. Studio Live! is a large open room with a stage on one side, and has hosted such artists as Ruth Moody, John Brooks, and the pianist from the Vancouver symphony. The intimate setting is perfect for a cooking venue, and a small editing room to the side with four screens projects the different angles that are being filmed. Mattila has 11 cameras he can use for filming and points out the ‘flagship main shot’, which he laughingly says is “the best camera you can buy without selling your house.” In the editing room he demonstrates how he can superimpose the recipe that is being created right onto the screen. Frazier and Howlett are finding the words to kick off the show with and their playful dynamic immediately pulls everyone into the show. Frazier takes the lead with the cooking and Howlett supports by asking questions, reflecting on techniques and providing little tips like how to adapt the recipe to suit your own tastes and kitchen. Each segment is filmed and will later be edited into a concise presentation. I jot down things like, “Don’t be afraid of the black, you haven’t burnt it, you’re searing it” when the tuna is in the pan and “the trick is to let it sit” when a red pepper roasted on an open flame is put into a paper bag. I feel like I’ve just had a gourmet cooking tutorial, and while the focus here has been the camera, Edible Valley plans to host a similar venue with an audience. Edible Valley is currently selling tickets to a live cooking performance and tasting featuring Abuelo’s Corn Tortillas on July 7. The evening will feature a three-course dinner tasting with drink pairing where the food is cooked and discussed with the audience at each stage. It is an intimate and interactive venue that aims to teach people how to source and select local items and how to create meals out of them. The three-course tasting will include a shrimp and artichoke dip with Abuelo’s jalapeño tortilla chips, a tomato black bean soup with crispy tortilla garnish and two styles of fish tacos. “It’s really about educating people on how to get comfortable picking and using local ingredients,” says Howlett.